The last living World War I veteran died four years ago at the age of 110. Florence Green is one name among the more than 65 million individuals estimated to have participated in some capacity in “The Great War.” According to some estimates, more than 8 million soldiers died, with more than 20 million wounded. These staggering numbers are good for perspective on size and scope (consider also the more than 6 million civilian casualties), but terrible for portraying the existential toll on individuals, families, communities and nations. The numbers will never tell you anything about spectacular acts of bravery or simple kindnesses that may have lit a vast darkness like a candle flame. The numbers alone will not help us come to terms with history, or keep us from being condemned to repeat it. That’s why we need memorials. In January of 2016, the American World War One Centennial Commission announced that the team led by Chicago architect Joseph Weishaar (only 25 years old!) 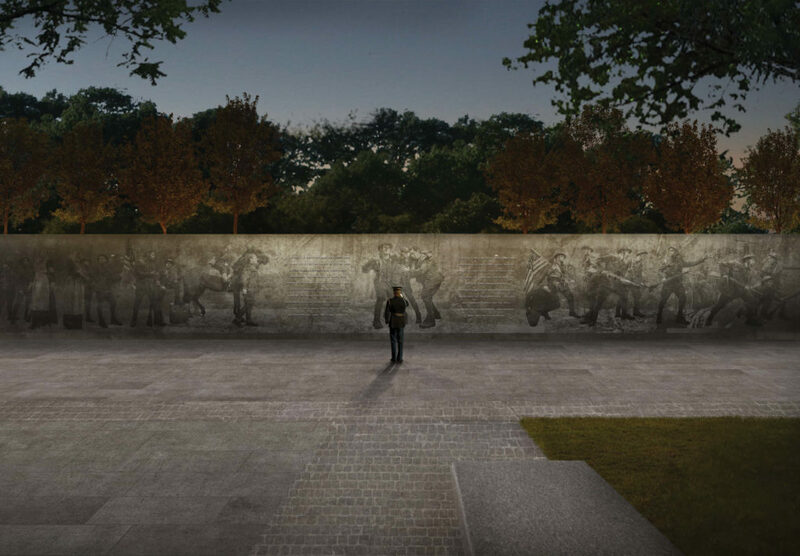 and New York sculptor Sabin Howard had submitted the winning design for the National World War 1 Memorial in Washington, D.C. The hopes are it will only take two years to build it – that’s the amount of time the U.S. spent engaged in the war – to coincide with the 100-year anniversary of the armistice to end the war in 1918. This is a moment frozen in time, captured in the darkened bronze form which has emerged from the soil to serve as a reminder of our actions. Along the North and South faces we see the emblazoned words of a generation gone by. 137 feet long, these walls gradually slip into the earth drawing their wisdom with them. Around the sculpted faces of the monument the remembrance unfolds. Each cubic foot of the memorial represents an American soldier lost in the war; 116,516 in all. Upon this unified mass spreads a verdant lawn. This is a space for freedom built upon the great weight of sacrifice.